If you are registered on the OT forum you will be receiving an email later this week from the organizers of the meeting with details on how to receive additional information when it becomes available. You are welcome to post your thoughts on this discussion but please be patient, and when the organizers have additional information it will be posted here or sent to you via email. The poster looks terrific. I like the colors. Looking forward to seeing some/all of you again in Omaha and look forward to the additional information as soon as it is available. The poster DOES look great! It certainly catches ones attention ~ that's what we want. The more people who see it and question, "What is OT? ", the better for us. My husband, Paul, and I plan to attend the meeting/research in Omaha in September, and I look forward to seeing everyone again. I will eagerly await more information regarding the meeting. I have received one notification via email and await the next, when information is available. I know it requires a LOT of work and organization; thank you to whomever is responsible this year. 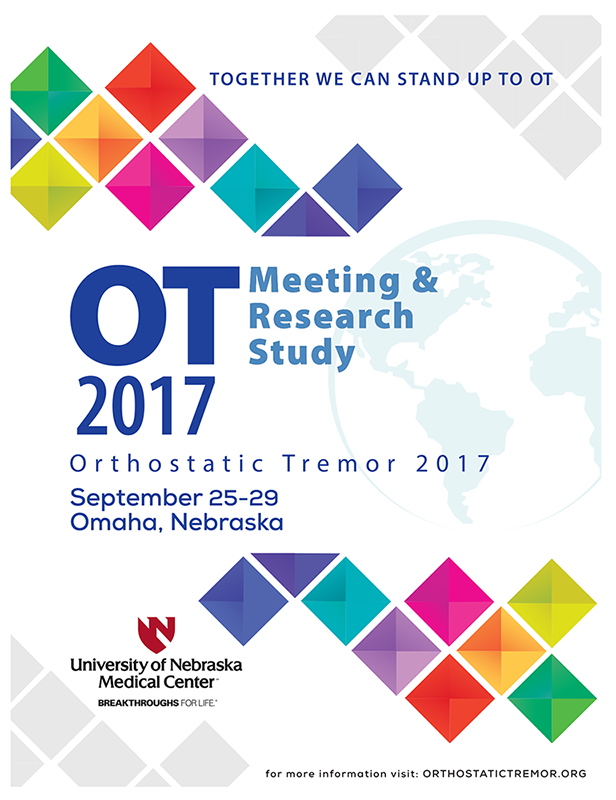 2017 OT Meeting and Research in Omaha Nebraska. If you have any questions please respond to the contact information below. "If you know at this point that you are definitely planning on attending regardless of whether you are accepted into the research, you can advise your contact person of this." Since I was accepted for the last research study program, wouldn't I automatically be accepted for the one this coming September? I will send my personal information to the person indicated. I really have no knowledge on who is going to be accepted or not into the research. The best thing is to just send in your contact info to the designated person and it will be forwarded on to Dr. Torres-Russotto. It will be nice to see you and Paul again Betty and I will look fwd to it. Just wondering if you are not being part of the research what are you going to do for 5 days ? When will they let us know ? I also agree that the poster looks great . I know that you will have plenty of time to make plans after you have been notified if you are part of the research. Peggy this timeline does help, and appears it would be sufficient time to make plans. I am looking forward to the September meeting in Omaha. My husband and I plan to attend again for this meeting. I was just thinking that I may not have mentioned that Dr. Torres-Russotto has stated that anyone that has OT will be accepted into the research. Just thought I should advise on this and my apologies for not mentioning it sooner. I am new to this group and want to sign up for the September meeting. How do I do that? I have copied this info from a post sent in earlier. Iif you scroll up to see other posts, you can read the complete post.